Simple, safe and convenient multi-dose medication packaging that is changing doses of frustrations to doses of convenience. Benzer Pharmacy is coming to the rescue of seniors who are on multiple medications. The pharmacy announced today the introduction of a custom pill tray to be used by patients taking over 10 medications in a day. As the population ages and an ever-increasing number of pharmaceuticals are produced to deal with chronic illnesses, patients are dealing with 10, 15, even 25 medications in a day. Some are taken in the morning, some at night, some with meals, and some might have to be split in half. Lindsay Wall, a clinical pharmacist at Benzer Pharmacy, says she has patients with more than 25 doses per day and compliance can be a challenge for older patients. According to the American Heart Association, many Americans have been put on a very complicated regimen that requires them to take several pills a day. Elderly patients, in particular, have several bottles of pills, which leaves them overwhelmed. “Taking medication incorrectly, or forgetting to take it, is one of the main reasons patients like these get readmitted to the hospital or placed in nursing homes,” Alpesh Patel, President for Benzer Pharmacy, said in a statement. This once weekly dispensing system provides the user with daily removable cartridges designed to be carried in a purse, briefcase, or coat pocket. The pill tray is designed especially for those on MedSync programs as each compartment is large enough to hold multiple prescriptions, including those with larger pills. “The versatility and detail of the custom pill tray allows you to eliminate the guesswork of administering your own medications and minimize common dosing errors,” adds Alpesh Patel. The custom pill tray is the greenest of all compliance and adherence solutions because it can be used for months and years before having to be replaced. Benzer Pharmacy customers can get the custom pill tray for only $7.00. 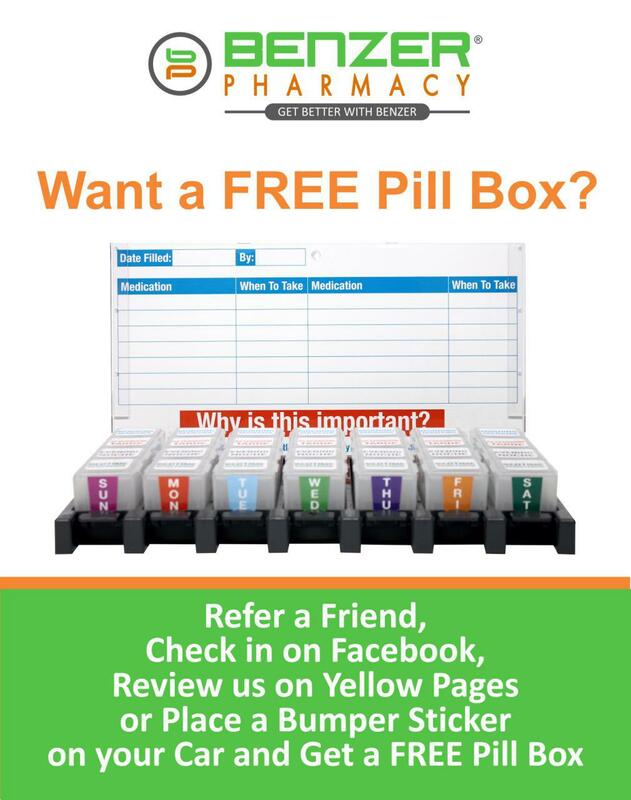 In order to get a free custom pill tray, customers can opt to: review the pharmacy on Yellow Pages, check in on the company Facebook page, refer a friend or place a bumper sticker on their vehicles. No more forgetting if you took your medicine or the inconvenience of carrying multiple vials. For more information, call 877-819-8901.